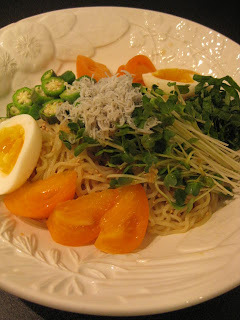 "Hiyashi Chuka" is a Chinese-style cold noodle dish, which is very popular in Japan in the summertime. My husband, Jason, loves my Hiyashi Chuka so much. I normally makes 2 large servings for him and he finishes both so quickly like a Japanese salaryman. 3 servings Chinese egg noodles, cooked according to the instructions and rinsed with cold water. 1. Combine the dashi stock, vinegar, mirin, sake, sesame oil and bring to a boil. Chill the mixture in the refrigerator. Add the grated ginger. 2. Divide the noodles into three bowls. Decorate with the toppings and pour the chileld sauce. 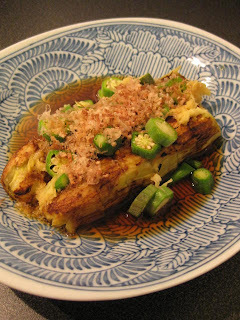 Serve with the pickled ginger (beni-shoga) and karashi mustard if you like. Grilled eggplant is one of my summer favorites. 1. Grill both sides of the eggplants over stove-top grill (I use the fish grill) over high heat until eggplants are soft. 2. Cut off the head of each eggplant and peel off the skin. Cut into bite-size pieces. 3. Boil the water, add a small amount of salt, and blanc the okra for about 1 minute. Drain and rinse with cold water. 4. Cut off the head of each okra and slice into thin pieces. 5. Combine the dashi stock, sashimi shoyu and grated ginger. Add a little amount of salt if necessary. 6. 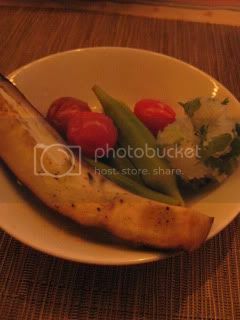 Place the eggplant in a plate with the okra slices. Pour the sauce. Chill it in the fridge for 30 minutes. 7. Garnish with the bonito flakes, and serve with grated daikon if you like. Last Sunday was another Hollywood Bowl night! We saw Dengue Fever, Of Montreal, and Grace Jones!! Just as I described in the last blog post, I cooked the brown rice with the dashi konbu, which was once used for making dashi. Then, instead of just snacking on the konbu after cooking the rice, I sliced it very thin and mixed with chopped wakame, sesame seeds, and sea salt. I tossed the mixture with the brown rice and made onigiri (rice balls). To eat, I wrapped the onigiri with a piece of shiso and nori seaweed. Wonderful! I also made smoked fish with the tagine-style donabe ("Fukkura-san") and Kabocha salad. 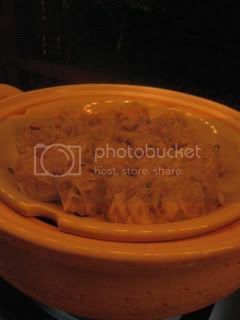 Tagine donabe smoked fish is becoming our standard picnic dish. Every Saturday, I make dashi stock with my classic-style donabe. I wish I could make my own dashi stock every day, but during the week, I sometimes have to use the dashi "tea" bags for the short-cut (after coming back from work, I don't have time for soaking the combu for 2 hours to make my own dashi). Living in Los Angeles, I hear many American people think cooking Japanese dishes is difficult because making dashi stock is difficult. That's true, if you want to make the real artisanal dashi stock like the professional Japanese chefs do. But making the home-style "rustic" dashi is VERY EASY (you don't even need a knife to chop anything) and it's really nothing is better than cooking with your own dashi stock!! So, I hope more American people will try making dashi with the donabe and start to enjoy cooking Japanese dishes. First thing I do is to infuse the dashi konbu (dry kelp) with pure water for 2 hours. (You can cut the soaking time for as short as 30 minutes, but the longer soaking can achieve the better flavor.) The kelp will grow really big in the water. If a piece grows to big to fit the donabe, you can just cut it into half with scissors. Put it over medium-heat. Once you think it's close to boiling, remove the kombu. Then, add the fish flakes and wait until they rest in the bottom after turning off the heat. For your "perfect" dashi, you want to strain it through the strainer and fine mesh cloth. For my "rustic" style, I don't use the cloth, so it will leave a small amount of residue in the bottom. As long as I don't stir, the residue stays in the bottom when I use the dashi stock. So it's just fine with me. Freshly made dashi stock should be kept in the fridge and used within 2-3 days. You can find the complete recipe on toiro's website. So, please check it out. Don't throw away the kombu used for making dashi! You can put the "used" kombu in the ziploc and keep in the fridge for a few days. I often slice them and add to a stir-fry, or add a square piece to Kamado-san (the double-lid rice cooker donabe) when cooking the rice. 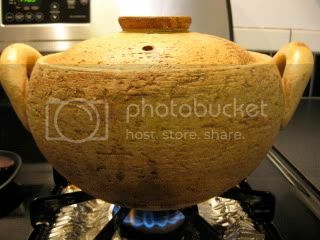 You just need to put it on the rice with water and cook normally. Even though it's used once, the kombu can still infuse the soothing flavor and your rice can taste upgraded by cooking with the kombu. What to do with the kombu after used for cooking the rice? I just snack on it! Just this morning, I received an inquiry from a gentleman in England. I tried to email him back a few times, but the email got hit back every time with an error notice. Yes, we ship donabe international! If you would like to order from outside of US, please let us know before placing an order. We can find the estimate cost for you first. For England, the estimate shipping cost is $60-70 (for 6-7 days shipping time) for "Kamado-san" (double-lid rice cooker donabe). Thank you always for your kind support! Hot curry in the hot summer! Before the summer ends, I want to eat as much okra as I can. 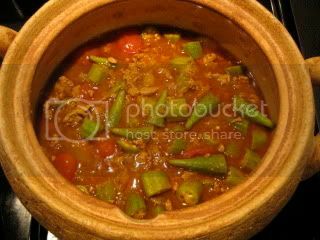 Tonight, I made a curry dish with okra. The soup & stew donabe ("Miso-shiru Nabe") is a perfect tool to cook this big flavor summer curry. It's my whimsical recipe and very simple. The onion is sauteed with the olive oil and butter over medium-heat. Ground kurobuta pork is added, and sauteed until cooked through. Then, curry powder, cumin seeds, and cayenne are added and sauteed more. Chicken stock, ketchup, salt and pepper are added. Once boiling starts, immediately reduce to simmer, add the cherry tomatoes, and simmer with the lid on for about 10 minutes. Add the okra and simmer for another 5 minutes. This donabe ("Miso-shiru Nabe") is made of the very thick porous clay, which is perfect for simmering even for a short time. Once it builds up the heat, it brings the heat to the core of each ingredient and integrate the flavors steadily. After turning off the heat, it continued to simmer the curry for a while. Perfect dinner!! I might want to make it again ext week. I paired the dish with 2000 Domaine Jean-Michel Gaunoux, Meursault, 1er Cru, "La Goutte d'Or". Meursault with curry? Yes, they go well together. This is a full-body white with the nice spice nuance. With the age (it's 9 years old), the round taste of the wine mellowed the palate after the spicy kick of the curry. It was a pretty difficult vintage, but this one was holding up quite well. The curry was served with (another perfect) brown rice, cooked with the donabe rice cooker, "Kamado-san". 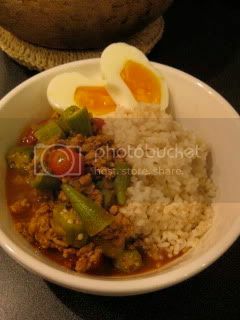 The recipe is posted on toiro's website. So, please check it out! After using my donabe pots so many times, they are getting more and more characters. The bottom parts of the donabe pots are changing colors. They have black stains from cooking. 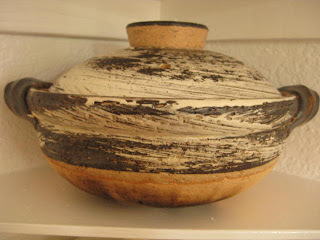 The black stains are the sign of donabe's hard work. They will only get more and more characters as I use them more. These are the proud stains. I love it. I love my donabe collection so much. I use them almost every day and I often use 2-3 donabes for one meal. The problem we tend to encounter for outdoor dinner is that the hot food gets cold so quickly. However, with the donabe, I just don't need to have such a problem. Today, we even cooked some of the dishes at our patio table. I made the simple mixed mushrooms with soy-butter sauce. The preperation is so easy. I sauteed the mushrooms with butter, then poured the soy sauce/ sake mixture. Steam-fried with the lid on for a few minutes, and drizzled the la-yu (hot chili sesame oil). With the lid on, the mushrooms were still sizzling after the donabe was brought to our patio table. 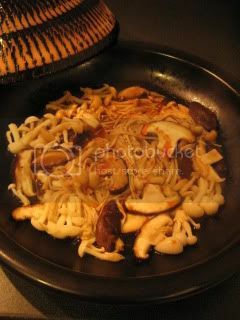 By cooking the mushrooms with the donabe, the flavors became so deep and just fantastic. 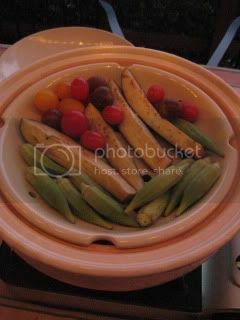 As an appetizer, we steamed the summer vegetable trio of Japanese eggplant, hairloom cherry tomatoes, and okra for about 4 minutes at the table. We enjoyed the steamed vegetables with the salt ponzu and grated daikon radish. For the main course, we steamed shumai (shaomai) dumplings! They tasted especially exceptional under the stars. 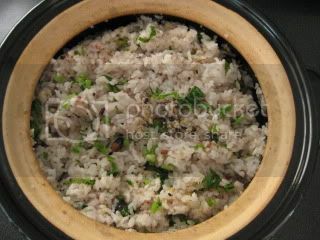 With Double-lid Donabe Rice Cooker, "Kamado-san"
We cooked our regular brown rice. We cooked the rice in the kitchen and let it rest in our patio for 20 minutes. The rice was fluffy and remain to be very warm for a long time. 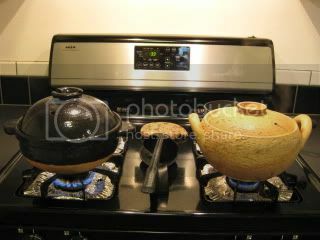 Our donabes except for Donabe Steamer are available on toiro's website. 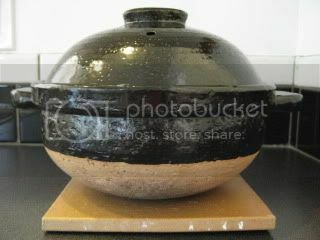 The donabe steamer is not available yet, so please stay tuned. 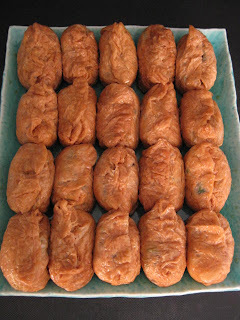 I made some Inari Sushi (sushi rice in fried-tofu pouch) to take to a dinner party at a friend's house. I got the nice homemade abura-age (pressed fried tofu) from Meiji Tofu. After slicing one side of each abura-age to open up to make it a pouch, I simmered them in a broth which contains dashi stock, sake, soy sauce, sugar and mirin with the drop-lid (otoshibuta) on. It's a slow simmer for about 30 minutes or longer until the broth is reduced down and abura age soaks up most of it. While cooling down the cooked abura-age, I made the sushi rice with Kamado-san (double-lid donabe rice cooker). I cooked the rice with a packet of multi grains, so that it's not only pretty visually but also the mixture is more nutritious. The cooked rice was quickly seasoned with brown rice vinegar-sugar-salt mixture. Then, at the end, I mixed in the sauteed daikon leaves. Stuffing each abura-age with the rice is as tricky as making each abura-age into a pouch at the beginning of the process. The tofu skin is very delicate, so you need to be very careful not to break it. After the careful preparation...20 inari sushi are ready! 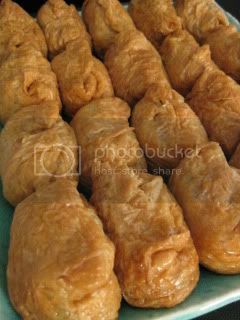 I posted the full recipe on toiro's website. 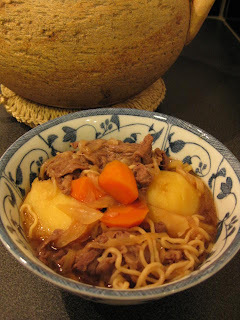 Nikujaga (Stewed thinly sliced beef and potatoes), which can be literally translated into "Meat-Potato", is one of the most popular "rustic" dishes in Japan. Its styles and ingredients vary from family to family, and from region to region. It's a simple dish and everybody loves it. I cooked Nikujaga with the soup and stew donabe ("Miso-shiru Nabe") tonight. This donabe indeed does a magic to a stew. I always like my nikujaga, but this time with the donabe, it came out to be the best nikujaga I'd ever made. I cooked it with exactly the same recipe as I always do. The only difference was that it was cooked with the donabe, instead of a regular stainless or non-stick pot. The recipe is very simple. I first sauteed the onion slices with the sesame oil, added the beef (I used premium Matsuzaka Beef) and vegetables. Don't forget to add the shirataki noodles (I used the tofu shirataki this time). Then, I added the dashi stock, sake, to simmer for about 10 minutes. After that, I added the sugar, mirin, and soy sauce, to cook for another 10 minutes. I posted the full recipe on toiro's website. So, please check it out! Just like many other Japanese dishes, the best friend for Nikujaga is the plain fluffy rice. So, two donabes were in action on the stove at the same time tonight. The slow-cooking effect and the heat retention of this donabe are exceptional. After turning off the heat, the stew was still simmering even after 10 minutes. 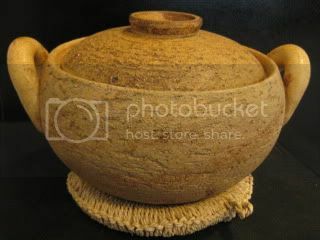 It's the thick porous clay from Iga, Japan, as well as the FIR (Far-Infrared Radiation) from its glaze, which cook each ingredient evenly to the very core. The broth had the deep soothing flavor, infused with the meat and vegetables. Meat was so succulent. Potatoes were rich and dense. Fantastic!! Oh, BTW, for me, adding shirataki (or tofu shirataki) is a must for this dish. This Japanese yam-based noodles soak up all the great flavors of the broth. In LA, tofu shirataki can be found at many regular grocery stores. I think it's been quite popular among American people as it's delicious while the calories are so low (shirataki has ZERO calories)! 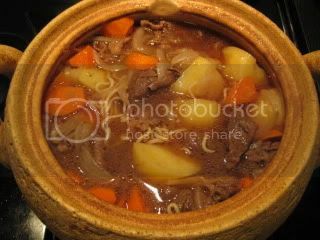 You can find more information about the soup & stew donabe ("Miso-shiru Nabe") on toiro's website, too.